Figure 15 Static-fluid MR urography demonstrates a transitional cell carcinoma in the distal section of the left ureter. 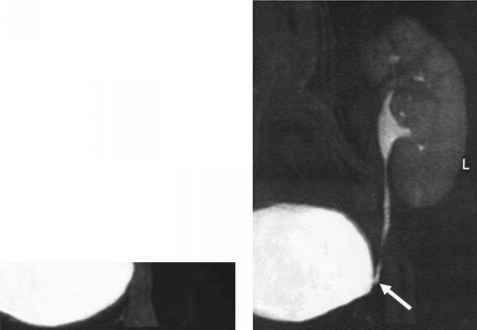 (A) Urographically, the tumor is characterized as a polypoid filling defect (arrow), causing moderate hydronephrosis. (B) On the sagittal MR urogram, the truncated ureter shows a concave widening (arrowhead), which is a quite typical urographic finding of endoureteral tumor growth. (C) The additional standard T2-weighted TSE sequence in the axial plane confirms that the filling defect is composed of a soft tissue mass (black arrow). The absence of any susceptibility-related signal void excludes the differential diagnosis of calculus disease. Abbreviations: MR, magnetic resonance; TSE, turbo spin-echo. Y-graft Prostate cancer Retrocaval ureter sections demonstrates location, size, and signal morphology of a retroperitoneal mass. As with imaging of transitional cell carcinoma, MR urography can be employed as an add-on to demonstrate the extent of urinary tract involvement, for example, in patients prior to gynecologic tumor surgery. Urographic signs for extrinsic compression are ureteral displacement and concentric stenosis either with gradual tapering or with abrupt truncation of the ureteral lumen (Fig. 16) (3,5,8,36). It is unclear whether MRI is able to differentiate ureteral tumor compression from extrinsic infiltration of the ureteral wall. A filling defect is missing, and a goblet sign is not seen. The combination of MR angiography and MR urography in a single session has the potential to replace IVU plus digital subtraction angiography in the preoperative assessment of live renal donors (27,48-50). Moreover, imaging of the urinary tract of transplant kidneys may become a new domain of MR urography in the near future. Because the administration of nephrotoxic iodinated contrast agents is undesirable in transplant kidneys, conventional IVU or CT urography are often inapplicable imaging tools. Ultrasonography is of limited use for the assessment of transplant urinary tract disorders, which explains why urologists sometimes resort to antegrade pyelography. Thus, there exists a certain diagnostic gap with regard to conventional imaging of the urinary tract of the transplant kidneys. This gap may now be closed with the availability of modern MR urographic techniques (3,26,36,51). MIPs provide detailed urograms of the transplant urinary tract (Fig. 17). Imaging of the transplant urinary tract is often related to complications affecting the ureter. Common causes of a ureteral stenosis may be a stricture, kinking, or extrinsic compression by a lymphocele. In the early postoperative phase, a urine leak may typically occur secondary to necrosis and perforation of the transplant ureter. Calculi and even intrinsic tumors are further urographically relevant pathologic findings encountered in transplant urinary systems. Figure 16 The combination of standard abdominal MRI plus MR urography is useful for the assessment of retroperitoneal tumor disease associated with extrinsic stenosis of the urinary tract. (A) In a male patient with abdominal lymphoma, the conventional axial T2-weighted TSE image reveals several enlarged para-aortic lymph nodes (black arrows), some of which are located next to the right ureter (arrowhead). 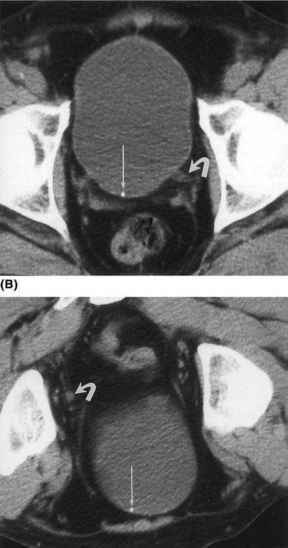 (B) Excretory MR urography is performed as an add-on to conventional gadolinium-enhanced MRI. 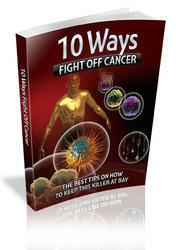 For this purpose, no extra injection of contrast material is necessary. 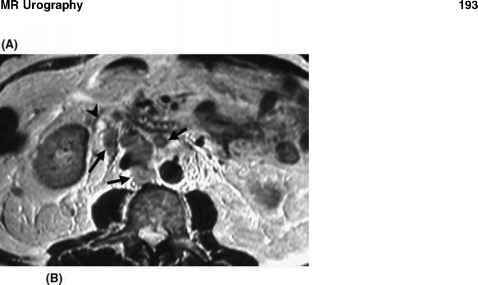 The exact configuration, location, and length of the extrinsic stenosis is best seen on the MR urogram (arrow). Note that a fine stream of gadolinium-enhanced urine is still able to pass this stenosis, which also explains for the preserved excretory function of the right kidney. Abbreviations: MR, magnetic resonance; MRI, magnetic resonance imaging; TSE, turbo spin-echo. Figure 17 MR urography obtained as a follow-up examination after renal transplantation in a female patient. (A) Coronal and (B) oblique MIP images from excretory MR urography provide a good delineation of the nondilated pelvicalices and the entire course of the transplant ureter. The excretory function is not impaired. Abnormal ureteral kinking, obstruction, and leakage of urine are not detected. Even the vesicoureteral junction can be assessed without superposition of the bladder (arrow). Abbreviations: MIP, maximum intensity projection; MR, magnetic resonance. lymphoceles, are easily identified with static-fluid MR urography (51). However, a compressed transplant ureter may not be demarcated from adjacent retroperitoneal fluid on T2-weighted images. Alternatively, good delineation of the transplant ureter can be achieved using gadolinium-enhanced T1-weighted MR urography, especially in conjunction with low-dose furosemide. Combining T2- and T1-weighted MR urography helps distinguish between a lymphocele and a urinoma. A urine leak is preferably diagnosed and localized with T1-weighted excretory MR urography by detecting extravasation of gadolinium-enhanced urine (3,22,26). Anyway, disorders of the transplant urinary tract are usually associated with an increased serum creatinine level. Static-fluid MR urography is performed irrespective of the excretory function. Initial data tend to indicate that excretory MR urography seems to be feasible in transplant kidneys with serum creatinine levels greater than 2 mg/dL, provided the transplant kidney is still able to excrete a sufficient volume of urine per day (22). For diagnostic follow-up after renal transplantation, MRI offers the interesting option of combining standard pulse sequences with MR angiography and MR urography, allowing the assessment of renal parenchyma, vasculature, and urinary tract during the same examination session with only a single injection of contrast material. Furthermore, it has been demonstrated that it is possible even in transplant kidneys to combine MR urography and MR nephrography for obtaining both morphologic information and the gadolinium excretion curve, similar to radionu-clide studies (52).